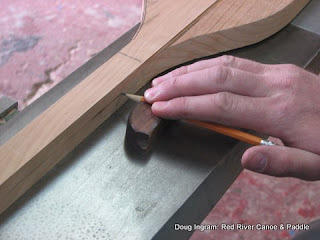 One of the most critical steps is to draw out an accurate center line along the side of the paddle. 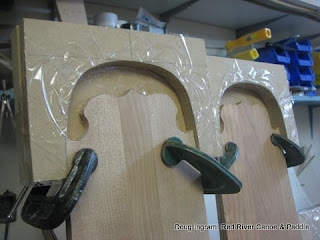 If this is not done well the paddle will have twists and crookedness built in. It looks very simple, and it is, but developing this little pencil holding jig required a lot of paddles to be made using less effective means! A proper pencil sharpener and a very flat surface are essential. 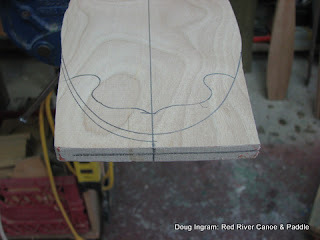 To establish the blade taper, I take the bulk of the wood off using the jointer. Other methods will work, but you need to evaluate the workability of the wood, the type of tools available, and your skill level. Fast tools make fast mistakes. 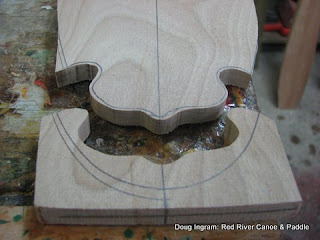 Once the taper is complete, I have to cut the paddle tip to make the protective tip. Step one is to trace out the cut line. Step 2 is to cut to the line. This reduces the amount of wood that the router has to take off. 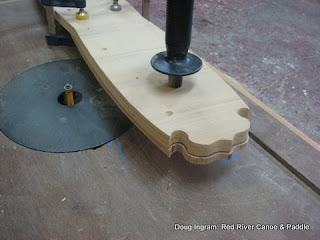 A flush trim router bit and a pattern clamped to the paddle. And simple dams are clamped to the paddle blade. Made from MDF and specific for each blade shape, the molds are covered with packing tape as a mold release to prevent the epoxy from bonding the whole thing together. This is as far as I got on this batch of10 paddles this week. Posted by Doug Ingram at 8:24 a.m.